French Guiana is an overseas department of France, located on the northern coast of South America. Like the other French departments, French Guiana is an overseas region of France, one of 26 regions of France. 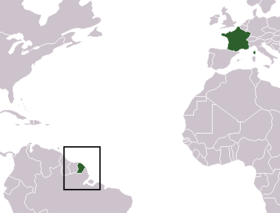 As a part of France, French Guiana is thus part of the European Union's territory, and its currency is the euro. Its population of 202,000, most of whom live along the coast, is very ethnically diverse, including indigenous tribes as well as people from France, the French-speaking Caribbean, Brazil, Suriname, and Haiti. Guianese Creoles (people of primarily African heritage mixed with some French ancestry) are the largest ethnic group. The main Asian communities are the Hmong from Laos and overseas Chinese. The main groups living in the interior are Native American Arawak and Maroons, descendants of escaped African slaves. Most of the land is still covered with untouched rainforest, and in early 2007 Guyana Amazonian Park was created, which will link to protected areas in neighboring Brazil. The network of protected areas will encompass 12 million hectares of tropical forest, making it the world's largest rainforest park. Though sharing cultural affinities with the French-speaking territories of the Caribbean, French Guiana cannot be considered part of that geographic region, with the Caribbean Sea actually being several hundred kilometers to the west, beyond the arc of the Lesser Antilles. French Guiana consists of two main regions: A coastal strip where the majority of people live, and dense, near-inaccessible rainforest, which gradually rises to the modest peaks of the Tumac-Humac mountains along the Brazilian frontier. French Guiana's highest peak is Bellevue de l'Inini (851 m). Other mountains include Mont Machalou (782 m), Pic Coudreau (711 m), Mont St Marcel (635 m), Mont Favard (200 m), and Montagne du Mahury (156 m). Several small islands are found off the coast: the three Iles du Salut Salvation Islands that include Devil's Island and the isolated Ile de Connetable bird sanctuary farther along the coast toward Brazil. The Barrage de Petit-Saut hydroelectric dam in the north of French Guiana forms an artificial lake and provides hydroelectricity. There are many rivers in French Guiana. The rainforests of French Guiana are still largely unexploited and face relatively few threats, although timber extraction is increasing. More than 90 percent of the country is forested. The possibility of finding gold in the interior regions is attracting foreign development interest and some illegal prospecting. Still, the country lost only 2.6 percent of its forest cover between 1990 and 2005, the lowest loss in South America. Average annual deforestation rates have actually declined by 17 percent in the twenty-first century. French Guiana has at least 5,625 species of vascular plants, of which 2.6 percent are endemic. The country has some 1,064 known species of amphibians, birds, mammals, and reptiles, according to the World Conservation Monitoring Center. Of these, 1.1 percent are endemic and 1.9 percent are threatened. Before the first Europeans arrived, there was no written history in the territory. It was originally inhabited by a number of Native American peoples, among them the Carib, Arawak, Emerillon, Galibi, Kalina, Palikour, Wayampi (also known as Oyampi) and Wayana. In 1498, French Guiana was first visited by Europeans when Christopher Columbus sailed to the region and named it the "Land of pariahs." In 1604 France attempted to settle the area but was forced to abandon it in the face of hostility from the Portuguese, who viewed it as a violation of the Treaty of Tordesillas. French settlers returned, however, in 1643 and managed to establish a settlement at Cayenne along with some small-scale plantations. This second attempt would again be abandoned following attacks by Native Americans. The French returned once more in 1664, and founded a second settlement at Sinnamary (this was attacked by the Dutch in 1665). In 1667, the British seized the area. Following the signing of the Treaty of Breda on July 31, 1667, the area was given back to France, though the Dutch briefly occupied it for a period in 1676. After the Treaty of Paris in 1763, which deprived France of almost all its possessions in the Americas other than Guiana and a few islands, Louis XV sent thousands of settlers to Guiana. They were lured there with stories of plentiful gold and easy fortunes to be made. Instead they found a land filled with hostile natives and tropical diseases. One and a half years later only a few hundred had survived. These fled to three small islands that could be seen off shore and named them the Iles de Salut (or "Islands of Salvation"). The largest was called Royal Island, another Saint Joseph (after the patron saint of the expedition), and the smallest of the islands, surrounded by strong currents, Île du Diable (the infamous "Devil's Island"). When the survivors of this ill-fated expedition returned home, the terrible stories they told of the colony left a lasting impression in France. In 1794, after the death of Robespierre, 193 of his followers were sent to French Guiana. In 1797, the Republican general Pichegru and many deputies and journalists were also sent to the colony. When they arrived they found that only 54 of the 193 deportées sent out three years earlier were left; 11 had escaped, and the rest had died of tropical fevers and other diseases. Pichegru managed to escape to the United States and then returned to France, where he was eventually executed for plotting against Napoleon Bonaparte. Later on, slaves were imported from Africa and plantations were established along the more disease-free rivers. Exports of sugar, hardwood, cayenne pepper, and other spices brought a certain prosperity to the colony for the first time. Cayenne, the capital, was surrounded by plantations, some of which had several thousand slaves. "Quartier Spécial" - Condemned men's block, St. Laurent, 1954 (the guillotine stood at the spot where the photographer took the photo). In 1809, an Anglo-Portuguese naval squadron took French Guiana (ousting governor Victor Hugues) and gave it to the Portuguese in Brazil. However with the signing of the Treaty of Paris in 1814 the region was handed back to the French, though a Portuguese presence remained until 1817. In 1848, France abolished slavery and the ex-slaves fled into the rainforest, setting up communities similar to the ones from which they had been taken captive in Africa. Now called Maroons, from the French word for "fugitive," they formed a sort of buffer zone between the Europeans who settled along the coast and main rivers, and the unconquered, and often hostile, Native American tribes of Arawak living in the inland regions. Without the availability of slave labor the plantations were soon taken over by the jungle and the planters ruined. In 1850, several shiploads of Indians, Malays and Chinese were brought in to work the plantations but, instead, they set up shops in Cayenne and other settlements. In 1852, the first shiploads of chained convicts arrived from France. In 1885, to get rid of habitual criminals and to increase the number of colonists, the French Parliament passed a law that anyone, male or female, who had more than three sentences for theft of more than three months each would be sent to French Guiana as a "relégué." These relégués were to be kept in prison there for six months but then freed to become settlers in the colony. However, this experiment was a dismal failure. The prisoners were unable to make a living off the land and so were forced to revert to crime or to eke out a hand-to-mouth existence until they died. In fact, being sent to French Guiana as a relégué was a life sentence, and usually a short life sentence, as most of the relégués died very quickly from disease and malnutrition. 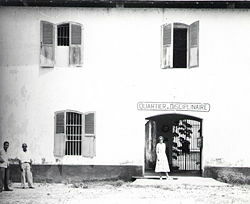 The prisoners would arrive at Saint-Laurent du Maroni before being transported to various camps throughout the country. The Iles du Salut were used to house political prisoners and for solitary confinement. The islands became notorious for the brutality of life there, centering around the notorious Devil's Island. Famous political figures to be sent to the islands included Alfred Dreyfus (the artillery officer of Jewish background whose trial and conviction in 1894, on charges of treason, became one of the most sensational political dramas in modern French history) and Henri Charrière, who managed to escape and later wrote a best-selling book about his experiences called Papillon. In 1853, gold was discovered in the interior, precipitating border disputes with Brazil and Dutch Guiana (these were later settled in 1891, 1899, and 1915, though a small region of the border with Suriname is still disputed). The territory of Inini, consisting of most of the interior of French Guiana, was created in 1930 and abolished in 1946. After the fall of France to the Nazis in June 1940, during World War II, the local government declared its allegiance to the Vichy government, despite widespread support for Charles de Gaulle. Known to be collaborators with Hitler, the Vichy government was later removed by the Allies in March 1943. French Guiana became an overseas department of France on March 19, 1946. 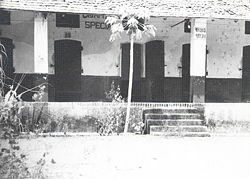 The infamous penal colonies, including Devil's Island, were gradually phased out and then formally closed in 1951. At first, only those freed prisoners who could raise the fare for their return passage to France were able to go home, so French Guiana was haunted after the official closing of the prisons by numerous freed convicts leading an aimless existence in the colony. Visitors to the site in December 1954 reported being deeply shocked by the conditions and the constant screams from the cell-block still in use for convicts who had gone insane and which had only tiny ventilation slots at the tops of the walls under the roof. Food was pushed in and bodies removed once a day. In 1964, Kourou was chosen to be a launch site for rockets, largely due to its favorable location near the equator. The Guiana Space Center was built and became operational in 1968. This has provided limited local employment, and the mainly foreign technicians and hundreds of troops stationed in the region to prevent sabotage bring income to the local economy. The 1970s saw the settlement of Hmong refugees from Laos in the county, primarily to the towns of Javouhuy and Cacao. The Green Plan of 1976 aimed to improve production, though it had only limited success. A movement for increased autonomy from France gained momentum in the 1970s and 1980s, along with the increasing success of the Parti Socialiste Guyanais. Protests by those calling for more autonomy from France have become increasingly vocal, ending in violence in 1996, 1997, and 2000. While many Guianese wish to see more autonomy, support for complete independence is low due to large economic support from France. French Guiana, as part of France, is part of the European Union, the largest part in area outside Europe, with one of the longest EU external boundaries. Along with the Spanish enclaves in Africa of Ceuta and Melilla, it is one of only three EU territories outside Europe that is not an island. Its head of state is the president of the French Republic, who appoints a prefect (resident in Cayenne) as his representative. There are two legislative bodies: The 19-member General Council and the 34-member Regional Council, both elected. French Guiana has two seats at the National Assembly in Paris. French Guiana has about seven active political parties, and it has traditionally been politically conservative, but the Socialist party (Parti socialiste guyanais, or PSG) has been increasingly successful in recent years. Though many would like to see more autonomy for the region, support for complete independence remains low. A chronic issue affecting French Guiana is the influx of illegal immigrants and clandestine gold prospectors from Brazil and Suriname. The border between the Department and Suriname is formed by the Maroni River, which flows through rainforest and is difficult for the Gendarmerie and the French Foreign Legion to patrol. The border line with Suriname is disputed. French Guiana is heavily dependent on France for subsidies and goods. The main industries are fishing (accounting for three-quarters of foreign exports), gold mining, and timber. In addition, the Guiana Space Center at Kourou accounts for 25 percent of the GDP and employs about 1,700 people. There is very little manufacturing, and agriculture is largely undeveloped. Tourism, especially ecotourism, is growing. Unemployment is a major problem, running at about 20 to 30 percent. In 2004 the GDP per capita of French Guiana at real exchange rates, not at PPP, was 12,887 euros (US$16,030), which was 59.9 percent of the European Union's average GDP per capita that year. French Guiana's main international airport is Cayenne-Rochambeau Airport, located in a southern suburb of Cayenne. There is one flight a day to Paris (Orly Airport), and one flight a day arriving from Paris. French Guiana's main seaport is the port of Dégrad des Cannes, located on the estuary of the Mahury River. Almost all French Guiana's imports and exports pass through this port. Built in 1969, it replaced the old harbor of Cayenne, which was congested and couldn't cope with modern traffic. An asphalt road from Régina to Saint-Georges de l'Oyapock was opened in 2004, completing the road from Cayenne to the Brazilian border. It is now possible to drive on a fully paved road from Saint-Laurent-du-Maroni on the Surinamese border to Saint-Georges de l'Oyapock on the Brazilian border. Following the signing of an international treaty between France and Brazil in July 2005, a bridge over the Oyapock River (marking the border with Brazil) is currently being built and is due to open at the end of 2008. This bridge will be the first land crossing between France and Brazil, and indeed between French Guiana and the rest of the world (there exists no other bridge crossing the Oyapock River, and no bridge crossing the Maroni River marking the border with Suriname). When the bridge is opened, it will be possible to drive uninterrupted from Cayenne to Macapá, the capital of the state of Amapá, in Brazil. French Guiana's population of 202,000, most of whom live along the coast, is very ethnically diverse. At the 1999 census, 54.4 percent of the inhabitants were born there, 11.8 percent were born in France, 5.2 percent were born in the French Caribbean (Guadeloupe and Martinique), and 28.6 percent were born in foreign countries (most notably Brazil, Suriname, and Haiti). French censuses do not record ethnicity, so estimates of the percentages of French Guiana ethnic composition vary, a problem compounded by the large numbers of legal and illegal immigrants (about 20,000). Guianese Creoles (people of primarily African heritage mixed with some French ancestry) are the largest ethnic group, though estimates vary as to the exact percentage, depending upon whether the large Haitian community is included as well. Generally the Creole population is judged at about 60 to 70 percent of the total population with Haitians (comprising roughly one-third of Creoles) and 30 to 50 percent without. Roughly 14 percent are Europeans, the vast majority of whom are French. The main Asian communities are the Hmong from Laos (1.5 percent) and overseas Chinese (3.2 percent), primarily from Hong Kong and Zhejiang province). There are also smaller groups from various Caribbean islands, mainly Saint Lucia. The main groups living in the interior are the Maroons (also called Bush Negroes) and Native Americans. The Maroons, descendants of escaped African slaves, live primarily along the Maroni River. 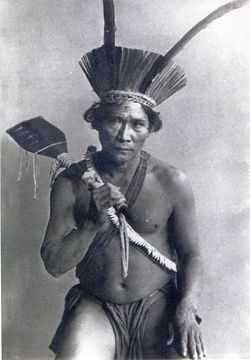 The main Maroon groups are the Paramacca, Aucan (both of whom also live in Suriname) and the Boni (Aluku). The main indigenous groups (forming about 3-4 percent of the population) are the Arawak, Emerillon, Galibi (now called the Kaliña), Palikour, Wayampi (also known as Oyampi) and Wayana. The predominant religion in this region is Roman Catholicism, though the Maroons and some Native American peoples still practice their own religions. The Hmong people are also mainly Catholic owing to the influence of Catholic missionaries who helped bring them to French Guiana. ↑ Eurostat, Regional GDP per inhabitant in the EU27. Retrieved December 20, 2007. ↑ (French) Government of France, Migrations (caractéristiques démographiques selon le lieu de naissance). Retrieved December 20, 2007. ↑ Danny Palmerlee, South America (Lonely Planet, 2007, ISBN 174104443X). Aldrich, Robert, and John Connell. France's Overseas Frontier: Départements et territoires d'outre-mer. Cambridge University Press, 2006. ISBN 0521030366. Belbenoit, René. Dry Guillotine: Fifteen Years Among the Living Dead. Berkeley, 1975. ISBN 0425029506. Belbenoit, René. Hell on Trial. , Translated from the Original French Manuscript by Preston Rambo. Reprint ed. New York: Bantam Books, Blue Ribbon Books, 1971. Charrière, Henri. Papillon. Reprints: Hart-Davis Macgibbon Ltd.,  2001. ISBN 006093479. Palmerlee, Danny. 2007. South America Lonely Planet. ISBN 174104443X. Redfield, Peter. Space in the Tropics: From Convicts to Rockets in French Guiana. ISBN 0520219856. Tissot, Jean-Michel. La Guyane telle quelle. Paris: Le Créations du Pélican, 1998. ISBN 2719103799. This page was last modified on 11 May 2017, at 14:38.